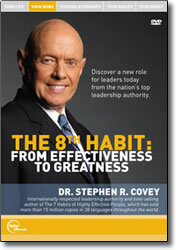 In this compelling video presentation, Stephen R. Covey teaches the principles of The 8th Habit to a live audience. His message will inspire you to discover your voice and your passion, and, ultimately, feel more engaged with the world around you. Dr. Covey pushes leaders to be not only effective but truly great. Today’s challenges require advanced leadership skills where leaders discover their own passion while motivating others to likewise find their own voice. Includes a bonus CD with the audio content from the video.